Thanksgiving to New Year's…. it's a weight gain nightmare, but it doesn't have to be! CHALLENGE: Stay fit and motivated during the calorie-filled holiday season by pledging to run, walk, bike or swim at least one mile every day, from Thanksgiving until New Year's Day... and then your New Year's resolutions take over! We call this The Holiday Mile ®. Open to Individuals and Teams! Registration includes a Finisher's Medal, Event Bib, Performance Wear T-Shirt, and chance to win prizes! You’ll find that once you get started, there will be days when you want to go farther—and then there will be days when one mile is enough (or more than enough). Either way, you'll get pulled in—you won't want to break your pledge, even if that means getting up super-early before a long car ride to squeeze in your mile. Be smart: pledge to run/walk “The Holiday Mile”® and you'll emerge from the holiday season unscathed, and maybe even fitter than you were before. We will also list winners on our daily check in page. Participate anywhere you want to. You can run, walk, bike, swim indoors, on a treadmill or outdoors. It doesn’t matter where your Holiday Mile takes you: you just have to do at least 1 mile straight and check in each day. Everyone who participates in the Holiday Mile will receive a custom finisher medal and an event t-shirt (Short Sleeve - Unisex or Ladies Fit & Long Sleeve Options). Packets will be mailed mid December. Team Packets will be shipped to the Team Captain. You don't have to do it alone! Get your friends to take the pledge with you. SPECIAL TEAM / COMPANY AWARDS! The Holiday Challenge® is designed to encourage and maintain healthy life styles and reward individuals for doing so. Organizations that adopt this challenge will discover they will increase morale, create a healthy work environment and help alleviate some holiday stress. If you have 10 or more people signing up in your group - We suggest signing up as a "Wellness" Sponsor. It is a flat fee and we send you a discount code that can be used as many times as you need. This allows your team members to sign up for free and you get listed as an event sponsor! SEE SPONSORSHIP OPPS HERE! CHARITY: This event is designed to keep individuals accountable for thier own goals and reward those along the way. All you have to do is keep your pledge... you can take it a step further by making it a charitable fundraiser, group or corporate challenge. TEAM BONUS: Form a team of 10 or more people and your group is eligible for some BIG prizes from us and there's more! We'll donate $25 gift cards to your organization to use as prizes. Use these items to motivate team members or donate to a charity of your choice. (One gift card per 10 people registered on your team). Form a team of 10 or more people and we will donate a $25.00 gift card for you to raffle off to your team members (One gift card for every 10 people signed up under your team name). Register 25 or more under your team and the TEAM CAPTAIN gets a hoodie! All Medals and T-shirts will be shipped to the Team Captain for distribution. Let your friends know you're all in, and they too will keep you accountable. Just insert the Holiday Mile Banner or Icon on your personal Facebook pages. Right click on the images and save to your desktop. Checking in with your mile(s) every day is our way of holding you accountable for your pledge. Each day you check in, you will be entered in to a weekly drawing. So each week you can have a maximum of 7 chances to win! There are two different ways you can check in (you only have to choose one, and it doesn’t have to be the same every time). 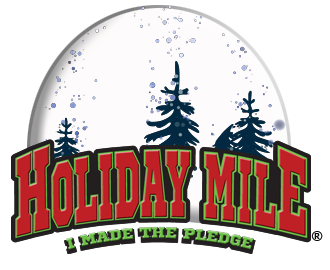 SUGGESTION: Stick to your pledge by making the Holiday Mile your "Start Up Page" on your web browser. Only one check in a day will be eligible for your entry to win a weekly prize. Winners of weekly prizes will be notified via email. Please be sure to add HM@5kevents.org to your safe sender list to ensure you receive updates from us. Be sure to make the post public so we can see it. Mailing of your custom race medal and event t-shirt will begin mid December.